Mrs Pramila Sharma had her education in Bombay. She was with us since the yearof our Academy’s inception since 1993. She was the secretary for the ICSE and ISC Board in Kanpur for the year 2006. She worked as a convenor for the schools of South Zone for the academic session 2009 -2010 and was re-elected as a convener for the academic session 2010- 2011. Mrs. Pramila Sharma was not just a Principal, but a lady of Principles- and quoted above is one of her Principles. 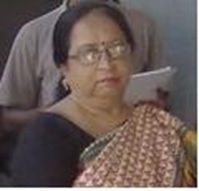 Mrs Pramila Sharma was fittingly, not just a Principal, but a lady of Principles- andquoted above is one of her Principles, never broken. She taught us to cherish life amidst work and to smile in the face of adversity until it surrendered. We pledge to keep her words, work and her positive attitude towards life, ALIVE. Her body left this earthly worldbut she hasn’t passed away, rather she passed on herself into each one of us.